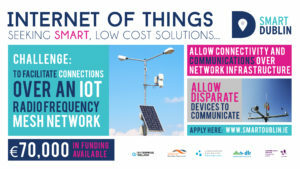 Dun Laoghaire Rathdown County Council seeks solutions to facilitate connections over an IoT radio frequency mesh network. The challenge is about the network to allow connectivity and communications over all potential network infrastructure. The required solution would provide the missing link insofar as it would allow disparate devices to participate in the network and will also secure future proofing of the network. The challenge is open for application until the 28th of June at 4 pm. Click here to see the Invitation to Tender – reference number RFT 133088. There was a briefing session for all prospective applicants in Dublin on the 30th of May. It provided the opportunity to discuss the requirements of the brief with Smart Dublin and Enterprise Ireland. See the presentations below.